Located in Blankenburg, this family-friendly property is 0.2 mi (0.2 km) from Blankenburg Castle, and within 9 mi (15 km) of Hexentanzplatz and Teufelsmauer Nature Park. Bode Gorge and Rosstrappe are also within 9 mi (15 km). Blankenburg (Harz) Station is 14 minutes by foot. 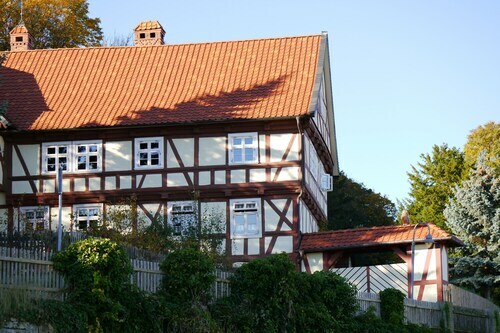 Situated in Blankenburg, this vacation home is 0.3 mi (0.4 km) from Blankenburg Castle and within 9 mi (15 km) of Hexentanzplatz and Teufelsmauer Nature Park. Rappbodetalsperre and Bode Gorge are also within 9 mi (15 km). Blankenburg (Harz) Station is 15 minutes by foot. 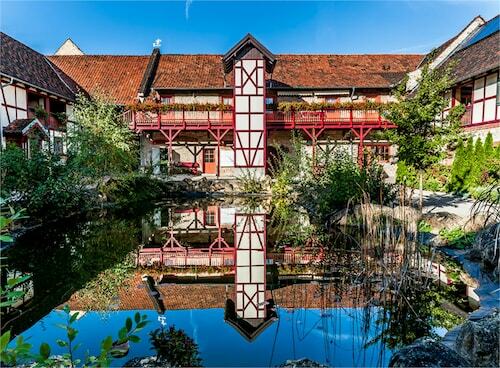 Situated in Blankenburg, this property is 0.2 mi (0.3 km) from Blankenburg Castle and within 9 mi (15 km) of Hexentanzplatz and Teufelsmauer Nature Park. Rappbodetalsperre and Bode Gorge are also within 9 mi (15 km). Blankenburg (Harz) Station is 14 minutes by foot. Situated in Blankenburg, this pension is 0.3 mi (0.5 km) from Blankenburg Castle and within 9 mi (15 km) of Hexentanzplatz and Teufelsmauer Nature Park. Rappbodetalsperre and Glass Manufacturer Harzkristall are also within 9 mi (15 km). Blankenburg (Harz) Station is 18 minutes by foot. Situated in the mountains, this property is 0.3 mi (0.6 km) from Blankenburg Castle and within 9 mi (15 km) of Hexentanzplatz and Teufelsmauer Nature Park. Rappbodetalsperre and Bode Gorge are also within 9 mi (15 km). Blankenburg (Harz) Station is 13 minutes by foot. Situated in Blankenburg, this property is 0.4 mi (0.6 km) from Blankenburg Castle and within 9 mi (15 km) of Hexentanzplatz and Teufelsmauer Nature Park. Rappbodetalsperre and Bode Gorge are also within 9 mi (15 km). Blankenburg (Harz) Station is 13 minutes by foot. Situated in the mountains, this property is 0.4 mi (0.6 km) from Blankenburg Castle and within 9 mi (15 km) of Hexentanzplatz and Teufelsmauer Nature Park. Rappbodetalsperre and Bode Gorge are also within 9 mi (15 km). Blankenburg (Harz) Station is 12 minutes by foot. 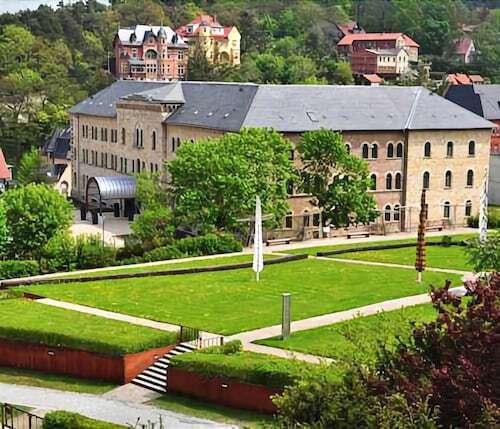 Situated in the historical district, this spa hotel is 0.8 mi (1.2 km) from Blankenburg Castle and within 9 mi (15 km) of Hexentanzplatz and Teufelsmauer Nature Park. Rappbodetalsperre and Glass Manufacturer Harzkristall are also within 9 mi (15 km). Blankenburg (Harz) Station is 7 minutes by foot. Situated in a rural location, this spa hotel is 0.5 mi (0.7 km) from Blankenburg Castle and within 6 mi (10 km) of Teufelsmauer Nature Park and Rappbodetalsperre. Hexentanzplatz and Bode Gorge are also within 9 mi (15 km). Blankenburg (Harz) Station is 12 minutes by foot. Situated in Blankenburg, this pension is 0.5 mi (0.8 km) from Blankenburg Castle and within 9 mi (15 km) of Hexentanzplatz and Teufelsmauer Nature Park. Rappbodetalsperre and Bode Gorge are also within 9 mi (15 km). Blankenburg (Harz) Station is 10 minutes by foot. Situated in Blankenburg, this vacation home is 0.4 mi (0.7 km) from Blankenburg Castle and within 6 mi (10 km) of Teufelsmauer Nature Park and Rappbodetalsperre. Hexentanzplatz and Bode Gorge are also within 9 mi (15 km). Blankenburg (Harz) Station is 11 minutes by foot. Situated in Blankenburg, this property is 0.5 mi (0.8 km) from Blankenburg Castle and within 9 mi (15 km) of Hexentanzplatz and Teufelsmauer Nature Park. Rappbodetalsperre and Bode Gorge are also within 9 mi (15 km). Blankenburg (Harz) Station is 10 minutes by foot. Get ready to experience a time warp when you visit Blankenburg Castle. Head over to Blankenburg to explore it. You'll find this destination about 95 miles (153 kilometers) outside of the state capital of Potsdam. If you're after a good hotel that's not too far away from Blankenburg Castle, the Schlosshotel Blankenburg/Harz, is the best option. It's situated just 0.3 miles (0.5 kilometers) away. If you need a little spark, you can keep your senses alive with a burst of caffeine. Savor your favorite coffee from Blankenburg Castle, just a short walk away. 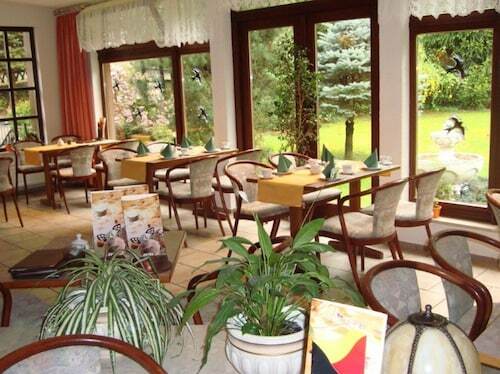 When you're in need of somewhere with a more comprehensive menu, Obere Mühle will appease a rumbling tummy. A glass of the local draught at "COMA" Cocktail Bar may hit the spot after a busy day. If you are intrigued by beautiful rugged landscapes, go and visit Bode Gorge. Walking paths and many photo opportunities are waiting to be discovered, so be sure to bring a lunch and enjoy the landscape! Whether you arrive there at the break of day or in the dying light of the evening, visiting Rosstrappe lets you experience the fantastic beauty of nature. The corridors of Walpurgishalle boast some intriguing historic stories. Learn more about this preserved structure by arranging a tour. Chasing that rush of adrenaline? Seilbahn Thale is the place for you. Prepare for an evening bursting with talent when you go to Harzer Bergtheater. How Much is a Hotel Room in Blankenburg Castle? 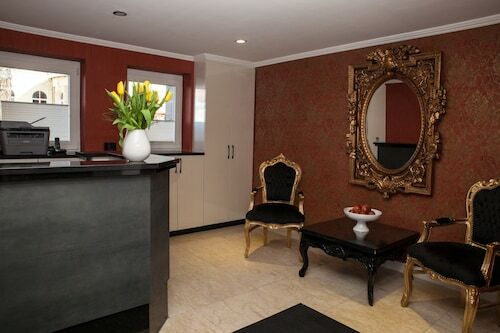 Hotels in Blankenburg Castle start at $109 per night. Prices and availability subject to change. Additional terms may apply.